I found this official LOST Poster online today and it made me smile. Only a few more months and the final season will begin. I also realized that if I watch a past episode everyday, I’ll almost get through the whole thing before the new season premier. So, LOST fans, are you ready? If not, look very closely at who’s in the pic. Is that Boone? Michael? Shannon? Charlie?Are you excited now? Wow, this is gonna be good. This weekend Kristi and I took the boys and went to Birmingham to take care of a few things.… Flu shots for the boys, buy a few needed items at the mall, etc. On the way home Ethan asked me “Daddy, what is that?” as he pointed to the Vulcan statue perched atop of Red Mountain. I proceeded to explain to him that it was a statue that reminded us about Birmingham being a city known for making Steel. I also told him a few memories from my childhood, of my parents taking me and my sisters up to Vulcan at night to see the city lights. Without putting a lot of thought into it, I asked everyone if they wanted to go to Vulcan. Everyone said yes. So we made our trek through Homewood and found ourselves in the parking lot at the foot of Vulcan Park. I think Kristi was the first to make the following important observation… “Wow, It’s a little chilly out here.” We all quickly wished be had brought our jackets. The temp in Birmingham Saturday afternoon was in the 50’s. I think Ethan made the next important observation of the day… “Hey, I can see his booty.” Needless to say there was a lot of giggling between the boys due to that fact. We bought our tickets and quickly decided to head to the elevators for our journey to the top. Gavin let us know very soon that he was not a fan of the glass elevator and he wanted to go back down. His opinion was only strengthened when we stepped out of the elevator onto the observation deck to realize that 50 something degrees is a lot colder when you’re at the highest point in the city and there’s nothing blocking the wind from you. The only way I can describe it is to say that is was definitely “Vulcan cold”. Besides the cold weather, I was actually a little uncomfortable myself with the view. I haven’t been to Vulcan in many years. The last time I went the observation desk was an enclosed structure where you could look out the windows and view the Birmingham skyline. Since the Vulcan restoration project 5 years ago, they’ve made the observation desk an outside catwalk-like balcony that hangs around the outside of the base of the statue. So not only were we exposed to the winds, we were also able to see through the platform below our feet. I made the mistake of looking down once only to realize I would not be doing so again. Ethan was the brave one of us all. He ran around the observation deck like he owned the place, without a care in the world. He had no fear of heights and no concern for the freezing temps. Our tickets also granted us entry into the Vulcan museum, which was much nicer than I anticipated. They’re really done a lot to make that a nice tourist stop. They had activities for the kids and cool interactive Birmingham maps. We took a little time to check it all out. After we were done with the museum, Ethan wanted to go up Vulcan one more time. No surprise to the rest of us, Gavin did not. So while Kristi and Ethan headed back up, Gavin and I spent some time trying to stay warm on the ground. Here was the final great view of the day. If my iPhone had a better camera you might be able to see Kristi and Ethan waving at us from the observation deck. Good answer, Kristi. Good answer. I rarely remember my dreams. When I do they're usually very strange. Last night was no exception. Before I went to bed I saw a preview for a new movie coming soon called 2012. It's about the end of the world. I'm pretty sure I incorporated that into my dream. I dreamed that the oceans were rising fast and I was leading my family and a bunch of folks from church to find higher ground and shelter so we could survive. It was very tense. It actually took me about 10 seconds to realize I really didn't need to do all of those. I'm often amazed at the things I see in Wal-Mart. Last night Ethan noticed this while walking down an isle. I gotta say, that's probably a very effective way to end your mouse problem if you don't mind a very 'hands on' approach. 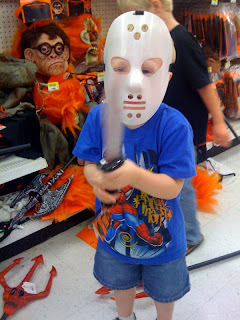 In the Halloween section at Walmart, Gavin headed straight for the goalie mask and bloody toy knife. I think I'll sleep with one eye open tonight. Through www.posterous.com supposedly I can post to all my online sites at once. We’ll see.